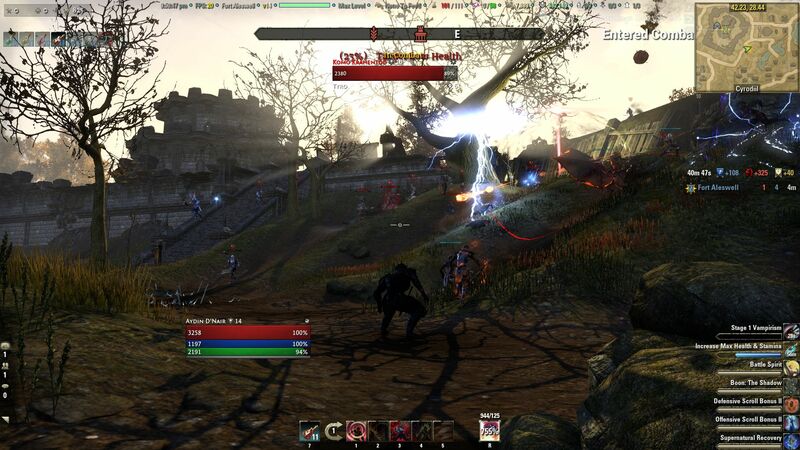 Home ‹ Elder Scrolls Online ‹ What is combat in Elder Scrolls Online? What is Combat in ESO? Traditionally in MMOs combat has been conducted via the ‘tab targeting’ system, whereby the player hit tab to lock on to an enemy and then proceeded to go through a series of button presses firing off their skills and if in range always hit . In recent years games like Darkfall have gone for a First Person Shooter approach whereby the player had to keep aim on their target and therefore judge not just distance but movement as well. So where does ESO sit within this range…. well in between. ESO requires aiming, although has the lock on feature of all console shooters when very close to the target. While there is a need to appreciate distance a static target will always be hit, but unlike a tab targeting system the target has a window of opportunity to move and avoid the strike. There are the standard array of weapons types, Melee, Bow, Staff (magic). Each of these will have a light and heavy attack. These are attacks that are less powerful than the skill attacks but consume none of your attributes and from the latest patch the heavy attack also gives back Magicka and Stamina. All the other attacks consume either magicka or stamina, when they run out your skills can’t be used. In ESO it is important to manage your stats as once they are gone you will most likely die. 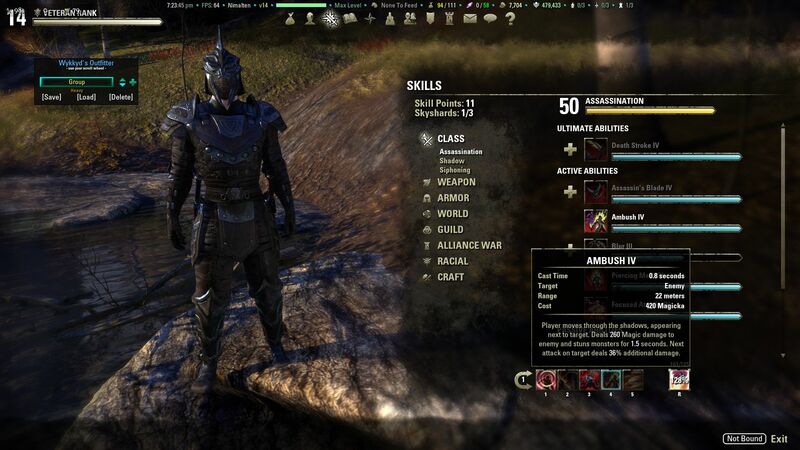 Now ESO isn’t all about attacking and being defensive is a big part of the game as well. Aside from skills every player has defensive abilities available to them, blocking, dodging and interrupts. Blocking is as it sounds a player blocks with their weapons or with a shield if holding one. Shield users are better at blocking than other weapon users but then they don’t have the damage output. Dodging, as was said earlier allows players to have a window of opportunity to avoid an incoming attack before if hits them, also dodging is the fastest way of getting out of an area that is about to be hit by an area attack from say a siege weapon. Interrupt is an important defensive measure which if the game is played by bashing button will be missed. In PvE especially your enemy may put out animation cues that they are about to conduct an attack, a player who is paying attention will see this and interrupt their enemy causing them to go off balance thereby changing the flow of the fight. This feature was needed on some Veteran level bosses, but because a lot players were used to button bashing fight mechanics they couldn’t defeat them and couldn’t work out why. 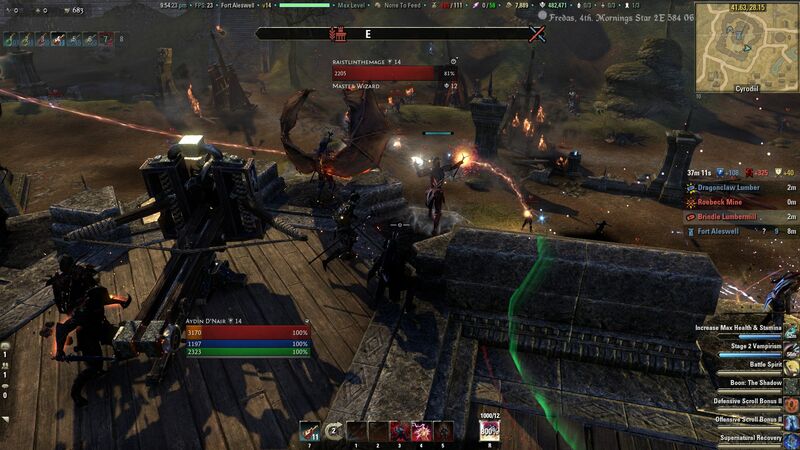 Big part of a lot of MMO’s is Crowd Control (CC) and ESO is no different but it has several layers of CC. Unbreakable stun, such as being knocked off a horse, hard CC which requires the players to breakout at a huge cost to stamina (if available), soft CC which can be rolled out of. There are several ways to avoid CC through skills, potions and blocking. 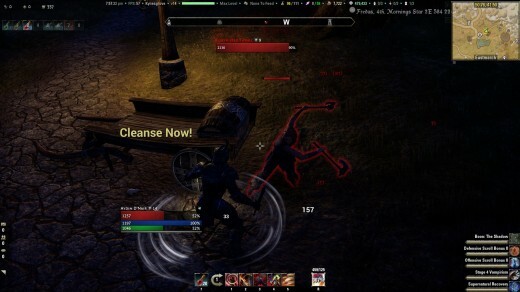 CC can be overpowered if not done correctly, in ESO there is a CC immunity which is shown as an animation below the players feet. This can be seen by yourself and your enemies and its important to pay attention to it to avoid wasting a CC skill on your opponent. Here I have just been rooted so I have broken out (notice the whirling circle which is the immunity) Also notice that my stamina has taken a massive hit. Distance is an important aspect of the game to judge. Each skill has a minimum and maximum distance that it will function at. Its important to know your own distances plus that of your enemies and to fight them where you are strongest and there are weakest. For instead Dragonknights are typically best in melee range whereas Sorcerers will want to fight at range, therefore the player will try everything to get their opponent in a range best for them. 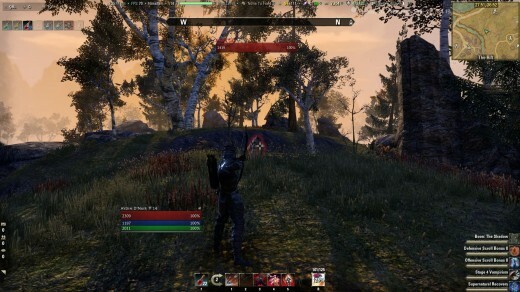 While operating in groups ESO allows players form of attacks that wouldn’t normally be available to them. These attacks are called Synergies and are activated where one of the group uses a particular skill. The rest of the group will then get a small window to activate a powerful skill associated with skill just used. For example a Dragonknight could use an Utimate whereby they put a standard into the ground this will give group members the option of then chaining a opponents to that standard for a period of time. In ESO every class has the ability to stealth, which allows players to tactic remain hidden at a chokepoint or sneak into positon. It also give the ability to hit harder and there is a bonus associated with being in stealth. As I mentioned before every player has the basis defensive abilities but there are also defensive skills which can be put on your weapons bar. These could give you the ability to purge a dot or snare, give immune to CC, reflect projectiles back on the attacker, absorb damage into health. 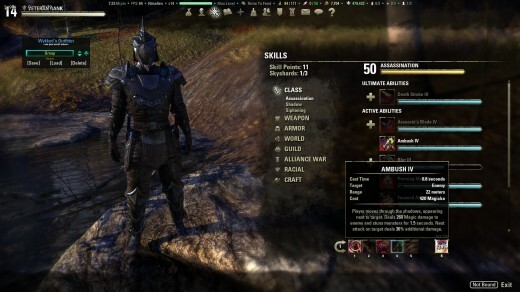 While these are powerful abilities they are short lived and with the system of only a few skills available players will have to make choices, which as I said is one of the strengths of ESO. With all this in mind is the combat any good? I have played PvP in Dark Age of Camelot, Vanguard and Darkfall and for me its better than them all. A pure tab targeting system from me is something from my past and takes away a lot of the twitch skill that comes with judging your opponent and the environment as you would find in a first person shooter. Darkfall, which had first person shooter mechanics had an extremely high skill level where the best were almost unbeatable and for the average player you felt that you didn’t have a chance. In ESO that’s not the case you need to practice to get good but the gap between the best and average isn’t huge especially given the choices that have to be made in skills. This means that anyone can be beaten and one on one you always feel that you have a chance and even if beaten you believe that with a change of tactics or slotting a different skill next time will be different, that’s the beauty of ESO. Great article. ESO does have a great hybrid tap-targeting combat that feels great. 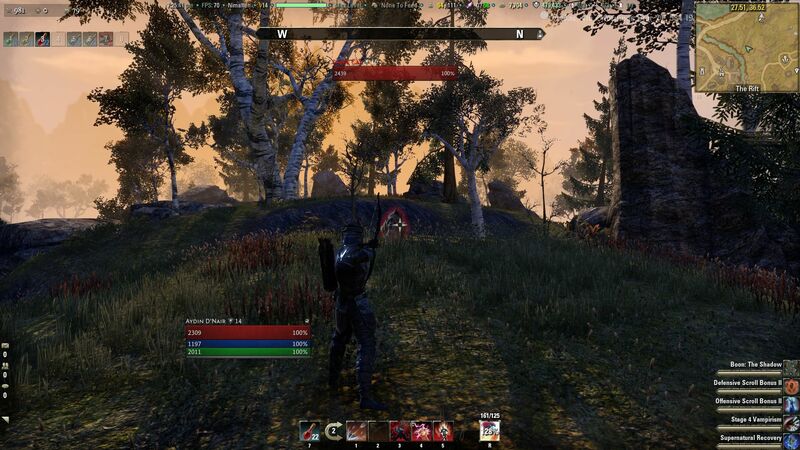 compare to other combat system like this in other mmo, Eso feels more…. heavy, unresponsive. I played some Tera before, and the combat system in that, you coud better control block and avoid, you had better control. There can be some unresponsiveness but a lot of this is down to the lag. Zenimax are tightening up some of the animations, which should make the combat even more fluid, but I would say if the game was truly unresponsive then the good players wouldn’t be able to take on multiple opponents which they do. In regards to block I don’t see how it could be any better controlled seeing as it overrides most of the animations. One area where there can be a problem and where there is complaints is when you get stuck in a cc cycle and that can make it feel unresponsive.